Photograph by Deepak Matadha, Rutgers University. MSU is asking Michigan residents in the northern lower peninsula and upper peninsula to report all sightings of the brown marmorated stink bug. Adult brown marmorated stink bugs are shield-shaped with brown mottling. They are between 14 and 17mm long, about the size of a dime. The bug was originally introduced to North America in 1996 but did not reach Michigan until 2010. 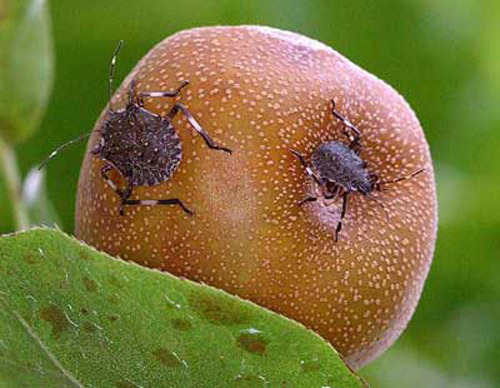 The brown marmorated stink bug feeds on a variety of fruits, vegetables, and crops, causing pitting, scarring, and a mealy texture of affected plants. The insect has also been known to feed on leaves which can kill a plant entirely. Aside from the physical damage, feeding wounds provide an entryway for disease to attack the host plant. If you are located in an area that is not marked "well established" on the map below, please contact the MSU extension office through this site to report any sightings of the brown marmorated stink bug. This entry was posted in Pesticide and tagged Michigan Stink Bug.